Japanese flower finds popularity in the South. 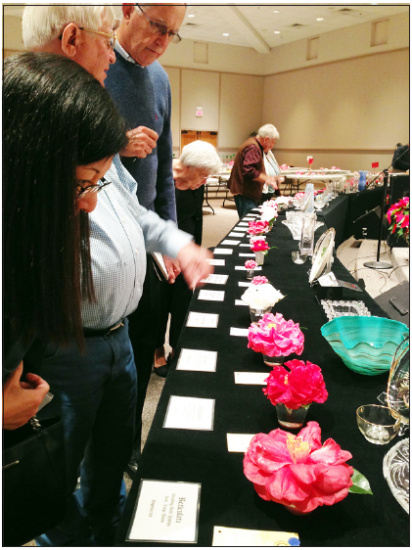 More than 1,000 camellia flowers that were grown in five Southern states were displayed at the 76thAnnual Camellia Show held last month in Pensacola, Fla.
Two local hobbyist groups hosted the event in cooperation with the American Camellia Society. Camellia, or tsubaki in Japanese, have been popular in the South. As a matter of fact, tea plants are part of the camellia family variety known as camellia sinensis, which was first brought to the U.S. in the Savannah, Ga. and Charleston, S.C. areas to be used for establishing tea plantations. 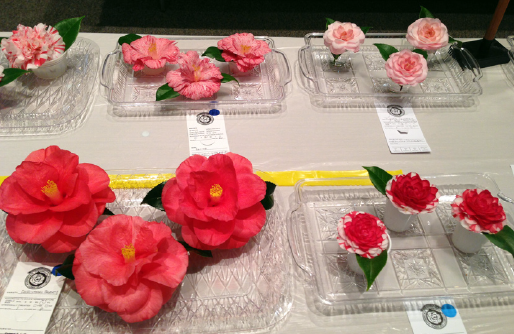 There are many varieties of camellia and the majority of them at the show were of the japonica variety that originated from Japan and China. Camellia japonica was brought to Europe from Asia around the 16th century and imported to the U.S. in the 18th century. At the show, 78 flowers received awards based on the size, color and type and were also divided into outdoor grown and indoor (greenhouse) grown. According to the chairperson of the show, Skip Vogelsang, the growers cut the best bloomed flowers four days before the show and kept them in a sealed container in a refrigerator until the day of the show to present them in their best condition. Jan. 17 and 18 — Pacific Camellia Society, Descanso Gardens, 1418 Descanso Dr., La Cañada, 1 to 4:30 p.m.
Jan. 24 and 25 — Southern California Camellia Society (Early Show), Descanso Gardens, La Cañada, 1 p.m.
Feb. 7 and 8 — San Diego Camellia Society, Casa Del Prado, Balboa Park, San Diego, 1 to 5 p.m.
Feb. 14 and 15 — Southern California Camellia Society, Huntington Gardens, 1151 Oxford Rd., San Marino, 1 to 4:30 p.m.
Feb. 21 and 22 — Southern California Camellia Society (Pomona Valley Show), La Verne Community Center, 3660 D St., La Verne, 1 to 4:30 p.m.
Feb. 28 and March 1 — Southern California Camellia Council (Spring Show), Descanso Gardens, La Cañada, 1 to 4:30 p.m.
March 7 and 8 — Camellia Society of Kern County, Bakersfield Racquet Club, 1660 Pine St., Bakersfield, 1 p.m.
March 14 and 15 — Pacific Camellia Society Late Bloomers Show, Descanso Gardens, La Cañada, 1 to 4:30 p.m.